Feeding roughly 31 million students each day is no small task. Evolving tastes, limited funding, the proliferation of food allergies, and a focus on decreasing risks for chronic disease and obesity can make getting meals “just right” difficult. However, we know when kids feel good physically, they will feel good mentally and perform better in school. Evidence suggests healthy eating, along with physical activity, can improve academic achievement. What kids eat in school cafeterias has a far-reaching impact. What can we do to successfully promote healthy eating to nourish students’ bodies and minds? The Academy of Nutrition and Dietetics notes the benefits of eating more plant-based meals. Encouraging kids to choose more plant-based meals helps them develop healthy eating habits: diets rich in vegetables, fruits, whole grains, legumes, and nuts are consistently linked to lower obesity rates, blood cholesterol levels, and blood pressure. Conversely, studies show that large amounts of meat in our diet are linked to obesity, heart disease, and certain types of cancer. Every school is unique, with its own demographics, cafeteria, geography, and local traditions and tastes, so it is important to implement a program that will work for the individual district and students. Many schools make an effort to provide healthier options by making all their meal options plant-based one day a week, while others begin with once a month. Others gradually implement programs by highlighting plant-based options on the serving line and à la carte stations, or adding options on Mondays or every day of the week. Studies suggest we are more likely to maintain a behavior throughout the week if we begin on Monday. This is why organizations like the American Heart Association support Meatless Monday as a component of a well-balanced diet. Entire school districts across the country are recognizing the importance of introducing more plant-based meal options by advocating for Meatless Monday, or meatless Lean & Green Days, which are designated days to offer plant-based meals. Kick-starting Meatless Monday or a similar initiative at your school can help meet the demand for healthier meals. It is also educational: Meatless Monday provides students with an opportunity to learn about new nutritious foods and exposes them to beans, legumes, and other protein sources they may be unfamiliar with. A plant-based diet not only improves children’s health, but the health of our future environment. Evidence suggests the current standard American diet leads to increased greenhouse gas emissions, land use, deforestation, water use, and energy use. Schools that have found success with Meatless Monday and similar initiatives are working to strengthen their health and environmental goals by reducing overall meat purchases by 20 percent, while placing an even greater emphasis on plant-based foods throughout their monthly menu cycles. Miami-Dade County Public Schools (MDCPS) in Florida has been participating in Meatless Monday for several years. 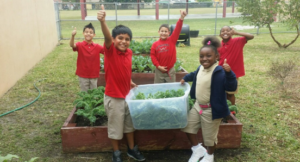 Because of the program’s popularity and the health and sustainability benefits, the MDCPS nutrition team chose to expand their initiative and partnered with Forward Food to establish their robust Lean & Green program. Forward Food is a group of dietitians, food policy specialists, and health care experts who traverse the country helping institutions like school districts and hospitals redesign their menus to focus more on plant-based foods. Designed as a free resource for schools looking to make simple, healthy changes, the program specializes in creating flavorful, standardized recipes that are appealing to students coast to coast. 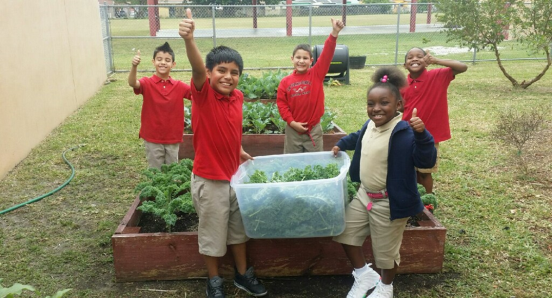 Through the program, MDCPS promoted their daily plant-based meal options while tying in existing sustainability initiatives like farm-to-school, school gardens, and compostable trays. The free branding and marketing materials Forward Food provided have allowed MDCPS to launch a far-reaching program encouraging students and families to add more plants to their plates. MDCPS continues to expand the program each year. To celebrate Earth Day, MDCPS featured new plant-based fare and is piloting plant-based stations in high schools. 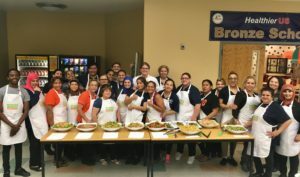 Much like MDCPS, Oakland Unified School District (OUSD) in California has been successfully participating in Meatless Monday and now, Lean & Green, for years. 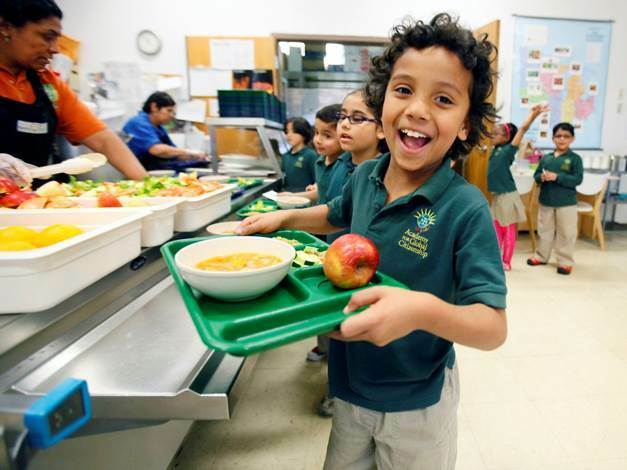 OUSD reduced meat purchases to reduce its carbon and water footprints. Shifting to less meat in favor of plant-based protein options over a period of two years allowed OUSD to reduce its carbon footprint by 14 percent and water usage by six percent, as noted by Friends of the Earth. This is equivalent to driving 1.5 million miles less and using 42 million less gallons of water each year! Even better, purchases of plant-based proteins and produce increased by ten percent while increasing student satisfaction. If this information has whetted your appetite for plant-based meals, then check out The Humane Society of the United States’ Forward Food program, which is partnering with schools nationwide. We have developed a database of over 70 free National School Lunch Program compliant, plant-based recipes. 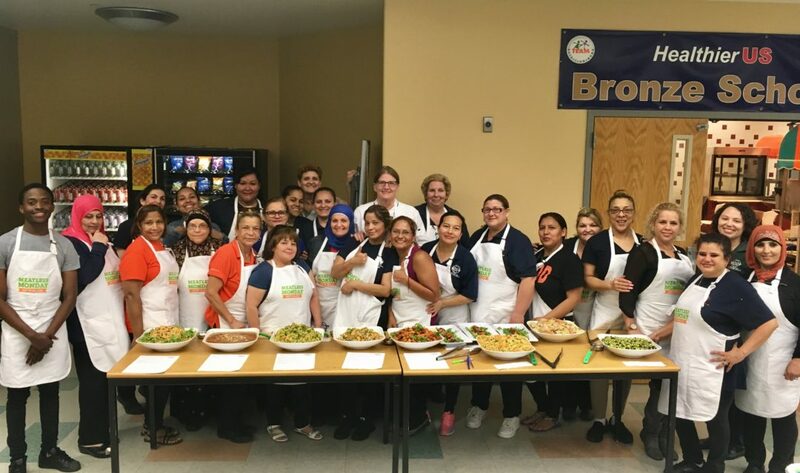 Additionally, we offer free hands-on, plant-based culinary training for school districts to help food service professionals learn how to prepare and market delicious plant-based fare. We take the responsibility of educating children about healthy food options seriously to help them make more informed decisions. The Humane Society of the United States advocates for the Three R’s of reducing or replacing the consumption of animal products and refining our diets by choosing animal products that adhere to higher animal welfare standards. To learn more about Forward Food, check out forwardfood.org for recipes, marketing materials, toolkits, media coverage, success stories, and other helpful information. Karla Dumas is the registered dietitian nutritionist with Forward Food kdumas@humanesociety.org. Rebecca Portman is the Georgia-based food and nutrition coordinator with Forward Food rportmant@humanesociety.org. Kate Watts is the Pennsylvania-based food and nutrition coordinator with Forward Food kwatts@humanesociety.org. Forward Food is a program of The Humane Society of the United States.